If we would keep artificial tissue in vitro instead of embedding it into the body — how may we use this synthetic human flesh and what innovative functions would this provide? Around 10 percent of births worldwide are premature; suspected factors are increasing fertility treatments, chronic stress and delayed motherhood. Recent advances in neonatal care preserves the lives of babies of around 300 grams, which equates to a piece of butter. The parents visit their premature born child in the Survival Tissue section of the clinic. Survival Tissue builds upon the potentiality of silken- based tissue engineering, taking it from the probable and preferable of Organ Crafting, into a possible, but unsettling and troubling realm of a future technological adaption. Conceptually, this synthetic tissue incubator for extreme premature born babies represents the missing quasi- object towards gaining public acceptance of the artificial womb. Such extremer forms of Assisted Reproductive Technologies (ART) are still repulsive to a majority of people on one end, but neonatal intensive care (NICU), such as the incubation of premature born infants, gains wide acceptance. Despite great successes with NICU, the problem is not only rooted in the early age of the infants, but also on potential side effects of birth procedure and postnatal circumstances. Recent research suggests that children delivered by cesarean delivery (CD) negatively affects the biodiversity of the infant's microbiome  . In contrast, children that are vaginally delivered were exposed to the maternal bacteria when passing through the birth canal, which colonises the otherwise sterile newborn's gut. Increasingly, premature children are delivered by cesarean section, or are preterm due to a scheduled cesarean section. Preterm infants are prone to infections and inflammations though and micoorganisms in the environment can seriously endanger their survival, meaning they are often given antibiotics and placed in an incubator. The troubling experience of being infantilised by human reproductive technology. Several studies have demonstrated that extensive skin-to-skin contact, e.g. the Kangaroo Mother Method (KMM) for low-birthweight infants dramatically improves their recovery  . Premature infants are currently lacking this life-saving skin contact, as they simply are to instabile for being exposed to the microbial climate of real skin, despite needing it the most. Biophilia — Survival Tissue's hypothetical design with synthetic skin could bridge this dilemma and improve an extreme premature infants’ survival chance; the soft tissue villi could be kept sterile, but perfectly mimic warmth and the sound of blood pulsation of the mother when interfacing with the child. 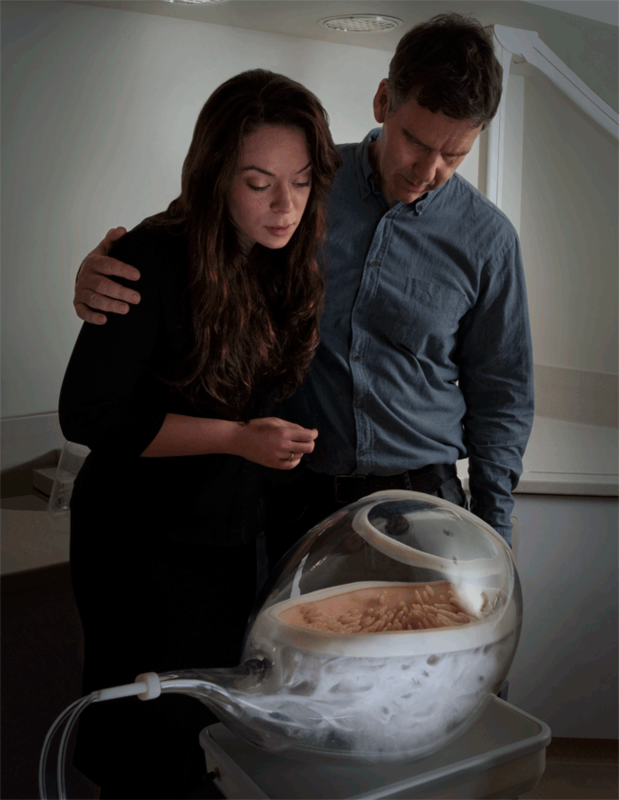 Once the child would be stabilised, the mothers' sequenced microbiome could be seeded into this incubator to precipitate a controlled and secure colonisation of the child's gut. Shy contact with the artificial tissue interface for their newborn. When technology promises solutions – despite unclear long-term health outcomes – it not only creates a dilemma situation for parents to actively decide on the fate of their child — it also puts parenthood and the role of pregnancy into the sharp focus of public, medical and economical observation. This design response represents a future design solution for improving the survival chance of premature children, but what ethical and emotional problems will we face through the progress of such technology? How do you measure potential medical benefits? And where do you draw the boundary of life? Bergman, N. J., & Jürisoo, L. A. (1994). The ‘kangaroo-method’for treating low birth weight babies in a developing country. In Tropical doctor, 24(2): 57-60. Sloan, N.L., Pinto Rojas, E. et al. (1994). Kangaroo mother method: randomised controlled trial of an alternative method of care for stabilised low-birthweight infants, In The Lancet , 344(8925): 782-785.